The history of women across the world is full of pioneers, who have broken gender barriers and worked hard to contribute to the betterment of the society. Women have fought for their rights and made progress in the field of business, politics, arts, science, law as well as activists, actresses, writer, astronauts. Let’s celebrate this International women’s day with pride and honor for their achievements. Here are some of the successful and influential women who have changed our world for the better. As the CEO of the 2nd largest Food and Beverage Company in the world, Indra Krishnamurthy Nooyi has been in regular listings of “World’s Most Powerful Woman.” The Indian born CEO started off her carrier with Pepsico in 1994 and gained recognition very soon as a president and CFO in 2001. Five years later in 2006, she became the CEO. Indra was born to a Tamil speaking Brahmin family in Madras where she graduated from University of Madras in 1974 and did her MBA from Indian Institute of Management Calcutta in 1976. Later she went on to the US and earned a master’s degree in Public and Private Management from Yale School of Management in the year 1978. Ever since Nooyi got promoted as CEO of Pepsico, she has played revitalizing role and company’s revenue increased by more than 70%. She is known for her mad business skills and has consistently taken the company in a profit-making direction since 2006. Some of her unique initiatives are that she has implemented eco-friendly business practices in the production, committed to working towards progress in health and sustainability, has been consistently working on creating jobs in various foreign countries and more. In 2007, she was awarded prestigious Padma Bhushan by the President of India. 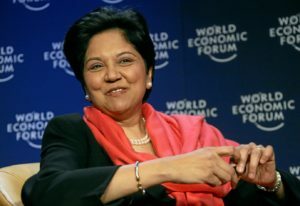 Fortune magazine has named Nooyi as The Most Powerful Business Women from 2006 to 2010. In 2013, Nooyi was named one of the “25 Greatest Global Living Legends” by NDTV. Oprah Winfrey is an influential talk show host, author, talk show host, actress, producer, author, media personality, and philanthropist. She is the richest self-made African-American woman in the world and is best known for hosting her own internationally popular talk show called “Oprah Winfrey Show” from 1986 to 2011. She is also ranked as the most influential woman in the world by several assessments. birth to a son who died infancy. However, life took its turn for better when she went on to live with her father who was strict but fair and encouraging. Oprah blossomed by becoming an honors student and winning a host of school awards. While at the high school, Winfrey started her part-time job and went on to become a first black female news anchor in US station’s history. 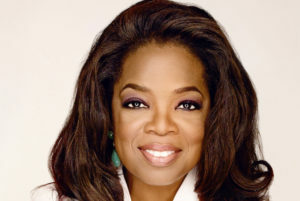 Oprah has co-authored five books and is considered to be one of the top best sellers. She has been a fine actress, a producer and a highest paid entertainer in the world. Also, she has made generous contributions to several charitable organizations and institutions. In 1986 Winfrey received a special award for the Arts for unique contributions to the city’s artistic community from Chicago Academy. She is also named as Woman of Achievement by the National Organization of Women. In 2013, she was awarded the Presidential Medal of Freedom by President Barack Obama and honorary doctorate degrees from Duke and Harvard. She has also won several Emmys for Best Talk Show, and Winfrey was honored as Best Talk Show Host. Malala is an activist for female education and the youngest Nobel Prize laureate. She is the founder of Malala Fund, a non-profit organization, which centralizes on helping girls go to school and raise their voices for the right to education. The fund focuses on three key objectives in Investing in girls’ education, channeling collective action to make girls’ education a true priority, and Amplifying voices of educational advocates. The 20-year-old Malala was born in Mingora, Pakistan and did her schooling from all-girls Edgbaston High School in Birmingham. She is now studying philosophy, politics, and economics, (PPE) from the famous Lady Margaret Hall, University of Oxford. Malala has co-authored “I am Malala,” which is considered to be an international bestseller. 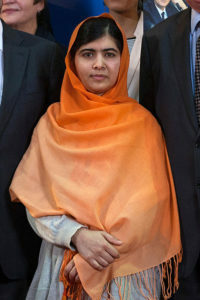 In 2011, Malala won a National Youth Peace Prize. 2018: she has received Princess Zebunisa in Swat, Swat Relief Initiative Foundation, Princeton, New Jersey. Angelina Jolie is cited as Hollywood’s highest-paid actress who is into filmmaking and humanitarian alongside acting. She is popular for her plays in blockbuster movies like “Lara Croft,” Mr. & Mrs. Smith, Wanted, Salt and Maleficent. Angelina was born in Los Angeles, California to actor Jon Voight and actress Marcheline Bertrand. Jolie has been acting from a very young age and rose to stardom in early 90’s. While in her early teens, Hollywood’s leading actress studied at a Strasberg Theater Institute and later attended New York University. Apart from being an actor, the actress she is a devoted humanitarian. She has also accomplished 40 field missions, meeting with refugees and internally displaced persons in over 30 countries. The actress has represented UNHCR as a Goodwill Ambassador from 2001-2012. She is also prominently involved in international charity projects, specifically those involving refugees. She is often listed as the “most beautiful women” by various media outlets. 2005: She was awarded the Global Humanitarian Award by the UNA-USA. 2013: Jolie received the Jean Hersholt Humanitarian Award, an honorary Academy Award, from the Board of Governors of the Academy of Motion Picture Arts and Sciences. Rowling is a British novelist, screenwriter, author, and producer who is best known for writing the Harry Potter fantasy series. The British author is listed on the best-seller list after achieving success in the seven-book Harry Potter series. Rowling is also called as the world’s first billionaire author. Joanne Rowling who goes by the pen name J.K. Rowling was born in Gloucestershire, England. From a very young age, Joanne wanted to be a writer and wrote her 1st book at the age of six. Joanne went to school at Wyedean Comprehensive School and then went on to study French and Classics at the University of Exeter. After her graduation, she took up various jobs in London, her favorite was working at Amnesty International charitable trust. She has also generously supported the charity which campaigns against human rights abuses, since the time she attained a new wealth. All series of Harry Potter was published by Bloomsbury, in the United Kingdom. Rowling’s books have not only become the best selling fantasy series in the history, but her fiction based film adaptations have also become one of the highest-grossing film series in the history. She had led rags to riches life, living on state benefits, faced lot many challenges before she published the first book in the Harry Potter series. J.K. Rowling has received many awards and honors for her writing of Harry Potter series and the related works. 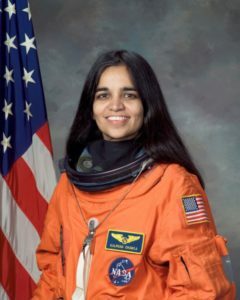 Kalpana Chawla was the first American-Indian women to venture into space. To fulfill her desire of becoming an astronaut, she worked for the biggest space exploration agency in the world called NASA in 1988. Her first opportunity to go to space came in November 1997. She was offered the position of Vice President of Overset Methods, Inc at NASA Research Center and was later assigned to do Computational fluid dynamics (CFD) research on Vertical/Short Takeoff and Landing concepts. Kalpana was born in Karnal, Haryana into a middle-class family. She did her schooling from Tagore Baal Niketan Senior Secondary School, Karnal and pursued a Bachelor’s degree in Aeronautical Engineering from Punjab Engineering College at Chandigarh, India in 1982. The very same year, she moved to the United States and obtained a master’s degree in aerospace engineering from The University of Texas. Her passion for becoming an astronaut at NASA led her to enroll for a Ph.D. and merited a doctorate in Aerospace Engineering from the University of Colorado in 1988. During the course of her two missions, Kalpana stayed in space for 30 days, 14 hours and 54 minutes, completing more than 80+ experiments in the space and fulfilling her dream to see the cosmos up, close and personal. After her untimely demise, many honors were bestowed upon her. She has an asteroid “51826 Kalpana Chawla,” named after her. In 2003: Prime Minister of India announced that the meteorological series of satellites, MetSat, to be named after her. NASA has dedicated a supercomputer to the great women Chawla. The Indian Institute of Technology, Kharagpur, named the Kalpana Chawla Space Technology Cell in her honor. The NASA Mars Exploration Rover mission has named a hill in the Columbia Hills on Mars as Chawla Hill.